This is being shared into viralness on Facebook. I spotted it here. 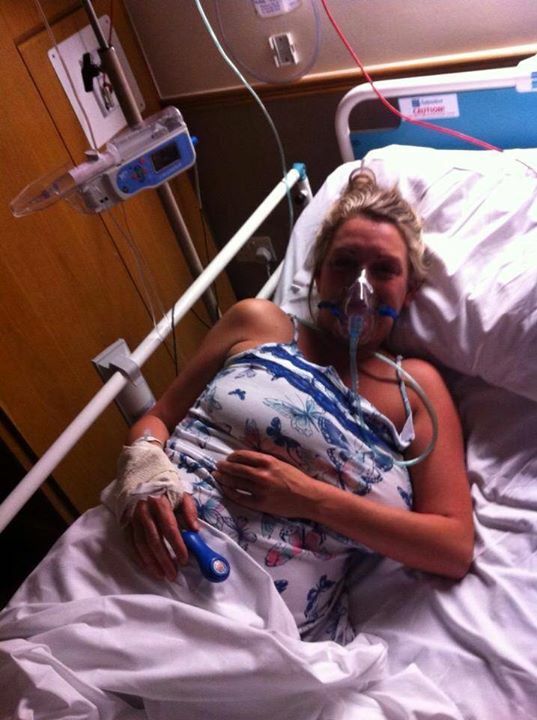 A: My benefits were stopped by ATOS as they found me fit for work whilst I was in hospital after a spine fusion and decompression revision, I am going to court next week to fight for my rights as a unwell single mother who’s life they have ruined. I dare you to look at that photo and tell me she can work. The outrage is perfectly understandable, but it is also more reasonable than some people seem to imagine. The family, friends and neighbours of Mark Duggan, the Londoner whose death at the hands of the Metropolitan Police in August 2011 triggered riots in big cities around the United Kingdom, were almost shaking with anger outside the High Court on Wednesday after hearing the verdict of the Coroner’s Inquest – that he was Lawfully Killed. When he was gunned down by an officer in the Operation: Trident unit, he was being pursued on suspicion of possessing an illegal firearm. Evidence that he had obtained the weapon a little earlier appears incontrovertible. He was in a taxi, travelling through Tottenham at the time he was cornered. After getting out of the taxi, one of the police, identified only as officer ‘V53’, convinced that Duggan was raising a gun to fire at them, opened fire twice. One shot hit Duggan in the torso, the other in the bicep. He died within moments. Searching the body, the police could not find a weapon on Duggan. Their position was that the gun was eventually found on a bank of grass on the other side of a fence near the roadside. The gun was supposedly lying between three and six metres from where Duggan had fallen. One of the problems is that the gun that was retrieved did not have Duggan’s fingerprints or DNA on it. It was hidden away in a sock, which did not have any of Duggan’s DNA or prints on it either. An empty shoebox that did have his prints on it was found in the taxi, so it is entirely possible that the gun was hidden inside it. But the Inquest did not really get to the bottom of how it was transferred from a box in the back of a taxi to a patch of grass on the other side of a fence by the road. The jury concluded that Duggan probably threw it there. Well yes, that is an obvious possibility. But once more, there are problems that the Inquest does not appear to have resolved. Firstly, including the eleven Trident officers present themselves, there was a number of witnesses who saw Duggan as he got out of the taxi, and not one of them saw him throw anything at any stage*. Given that the police officers themselves, who were still assuming Duggan was armed, had their eyes firmly on him while their own guns were trained on him, it seems an incredible suggestion that he could make a throwing action that not one of them picked up on. It was also suggested that Duggan might have thrown the gun away before getting out of the taxi. However, the taxi driver – who was himself on the receiving end of some pretty unfriendly treatment from some of the officers – remembers the shoebox, and stated that he never saw any indication that Duggan had opened it at any time, either during the journey or after the police had forced him to stop the vehicle, and also never saw him throwing anything. If Duggan had really taken the gun from the shoebox, why was there none of his DNA or fingerprints on the sock? Secondly, an independent witness, known only as ‘Witness B’, stated firmly that he had seen very clearly that the object in Duggan’s hand was made of a reflective material, and appeared to be a Blackberry mobile phone. It absolutely would not have been a fabric material such as a sock. He further stated that at the time he was shot, Duggan had both his hands raised in a surrender gesture. 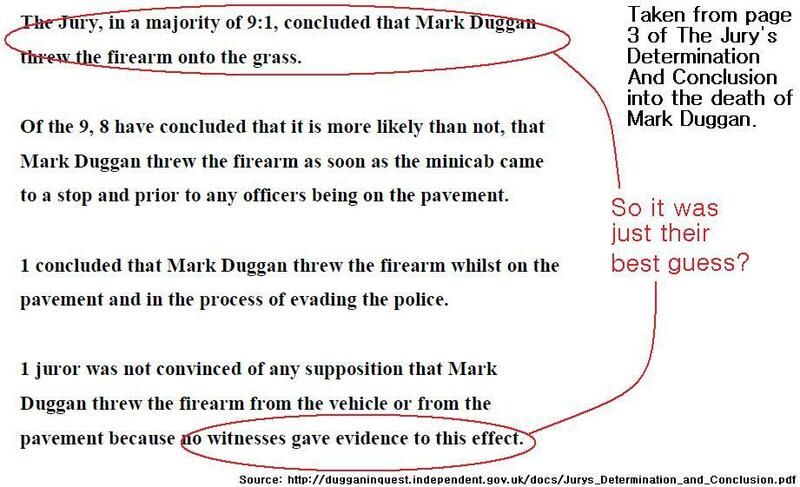 The only answer that the jury could offer for how the gun ended up where it did can be found on page 3 of the report published at http://dugganinquest.independent.gov.uk/docs/Jurys_Determination_and_Conclusion.pdf. It effectively says, “Duggan threw the gun, and just no one noticed.” No witnesses saw him do it, no evidence has been found that Duggan ever made any physical contact with either the gun or the sock that it was concealed in, but the jury still concluded that this is “more likely than not”. Exactly which evidence tells them that this is more likely than not has not been conveyed. Nor is any explanation offered for how there could be at least thirteen witnesses, and yet not one of them noticed Duggan throwing anything. That very page is quite explicit in acknowledging that, on whether Duggan threw the gun away, “no witnesses gave evidence to this effect”. It even describes the notion that Duggan threw the gun away as a “supposition”. The conclusion of the Duggan Inquest that he was ‘Lawfully Killed’ seems to hinge on guesswork. Quite simply therefore, the decision was their best guess, nothing more. It was a non-evidence-based conclusion. For sure, it is a plausible enough idea that Duggan had the gun and threw it away just before he was killed, and yes, a verdict of Lawful Killing demands only the balance of probabilities instead of proof beyond reasonable doubt. But a plausible idea is not the same as a measurable fact – there needs to be at least some kind of evidence that the notion might have a physical basis in reality. What the jury needed to do was establish why this particular explanation fits the known facts better than alternative explanations e.g. that the gun might have been lost by someone else at another time for unrelated reasons, or that the gun might have been planted there by the police themselves after they realised that they had killed an unarmed man. I am not saying, by the way, that either of these explanations is more likely than the jury’s conclusion, only that, from what is currently widely understood, they are no less likely, and there is no clear reason to assume that they did not happen. By extension, there is no reason to assume that Duggan had not rid himself of the gun earlier. By making these assumptions, critical deductive work has not been done, and so the Inquest’s work is not complete. It could still be argued that the police had no way of knowing whether Duggan had already ditched the weapon, but even so, shooting him when he was unarmed and was apparently offering to surrender appears reckless. Recklessness causing the death of a human being can fall under the definitions of ‘Gross negligence’ in a criminal court, and ‘Unlawful Killing’ in a Coroner’s Court, therefore it would appear that the verdict is unsafe. When a man’s death at the hands of the police is effectively written off as ‘just one of those things’ on the basis of guesswork, his family’s anger and confusion are inevitable. Whether the verdict will eventually prove to be correct, I do not yet know. But on the basis of what is currently understood, if it does prove to be true, it is blind luck rather than sound judgement and logical analysis that has got us there. Once again, the British judicial system has let the public down when attempting to investigate itself. * In fact, Duggan throwing the gun away potentially opens up a strange and unsettling tangent that does not appear to have been widely considered; what if Duggan did have possession of the weapon when he was cornered, what if he did throw it away, and what if the police secretly did notice him do so? This would immediately have guaranteed a verdict of Unlawful Killing, because it would have established at the moment he was shot that he was very unlikely still to be armed, and so there was unlikely to be any remaining threat to the lives of the police or any passers-by. Given there is clear evidence of some form of collusion in the taking of police statements about the killing (honestly intended or not, it has disturbingly familiar echoes of cover-ups after Orgreave and Hillsborough), there is the chilling possibility that officers agreed among themselves to pretend that none of them had seen the gun being thrown away. Although that would not account for the taxi driver or Witness B missing it as well. I’ve been getting some feedback over Twitter regarding the above from a few people who only appear to have been half-paying attention to it. Let me therefore clarify the above; I am not saying that the police actually planted the weapon, nor am I saying that the shooting happened for racially-driven reasons, at least not here. (I never even mentioned the subject of race in fact.) My point was that speculative suggestions about the killing are no more or less plausible than the conclusion that the jury reached. The jury argued that the gun ended up on the other side of the fence because Duggan must have thrown it there. That would be fine, if there were evidence of Duggan throwing it i.e. with thirteen witnesses to the incident, at least two of them saying that they saw him throwing something would constitute reasonable evidence. But the jury did not have any evidence of it of any kind at all. Nor did they have evidence that Duggan even made physical contact with either the gun, or what it was concealed in. Indeed, it is not certain that the gun found on the other side of the fence is the one he obtained earlier. What the jury came up with was an explanation that appears to fit the scenario, which is not the same as evidence, which requires a physical observation. The idea that Duggan abandoned the gun earlier, and that the gun found was actually lost by somebody else at a separate time, is a possibility that fits the scenario just as neatly. As is the suggestion that the gun might have been planted there. So to settle on their own conclusion, the jury needed firstly to establish why their explanation is likeliest, preferably including a worthwhile explanation for how thirteen witnesses could all miss the sight of Duggan throwing something. To date, I have seen no indication that the jury ever really answered these points, and that is why I assert that the Inquest verdict is unsafe. PLEASE NOTE: Saying a verdict is unsafe is not the same as saying it is wrong. It is simply saying that it was arrived at by a flawed method, and therefore it leaves open the possibility that it is wrong. It is more than possible that the jury’s conclusion is correct, but they do not appear to have made sufficient effort to make reasonably sure of it. Also, I need to make clear that I am not saying that Unlawful Killing would necessarily have been a correct verdict either. As no reliable indication has been found as to when Duggan parted company with the gun, and so no reliable information is available as to how much of a threat he posed at the time of the shooting, my personal view is that it should probably have been an Open verdict. Classing a police shooting as Lawful when a man is unarmed sets a worrying precedent for any time in future that an armed police officer opens fire when merely acting out of suspicion. Mr Fowler said the same. His evidence was read (22/10, page 171). firearm had not been found. He had asked R31 to look for the firearm and then he said that R31 informed him that he found the gun on the other side of the railings on the grassed area. Then he said, as indeed he said within his witness statement beforehand, an ARV, Armed Response Vehicle, arrived and “I asked them to go and preserve the scene where the gun had been found”. Now, everyone might have felt quite secure with that account if it wasn’t for Witness B, because it was Witness B’s BBC footage that showed that that couldn’t be the case. Without that BBC footage, this would have just been completely accepted and we would not have any worries about it. What the BBC footage showed, on R31 and everyone else’s account, is that at the time that V59 spoke to the ARV officers, neither R31 nor Z51 had found the gun. That’s why V59 was asked to come back to explain. He got rather heated in explaining it, because the way it was worked out, because of the BBC footage, showed that there was a great difficulty about this. Because we have got V59 directing officers to secure a gun which had not yet been found. Given that no witnesses saw the gun being thrown, and that the police themselves were stating at that point that the gun was missing, this raises a major doubt. How exactly did officer V59 know at such an early stage where the gun was to be found? Either one or more police officers did see the gun being thrown, in which case they would have known at the time of the killing that Duggan was probably no longer armed, or the gun was already there, probably for unrelated reasons, before Duggan arrived, or else someone put it there after the shooting. Has any of this been properly explored by the Inquest? As far as I can tell, no. And that again means that the verdict is unsafe, as it assumes that the gun was thrown away, and that the police were unaware of that fact, when the evidence and overall scenario do not seem to be very consistent with that. Further to the above, even more evidence has been found in the Duggan Inquest archive over the last couple of days, raising the doubts still further over how the gun could have ended up on the other side of that fence. A restricted (why?) 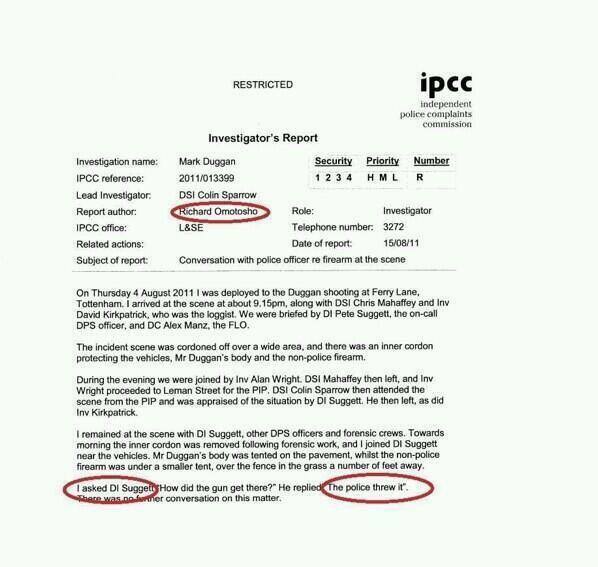 report from the IPCC authored by an officer called Richard Omotosho, and dated the 15th August 2011, states that he was present at the scene of the shooting to assist with the investigation in the immediate aftermath. The final paragraph of his statement is more than a little, shall we say, ‘interesting’? So, we have zero out of at least thirteen witnesses stating that they saw Duggan throwing anything, a police officer giving instructions to secure a gun before it has even been found, and now another officer stating quite explicitly that the gun ended up on the other side of the fence because of police actions, not because of anything Duggan did. I have to re-iterate that I am still not arguing as such that Duggan definitely did not throw the gun over the fence, only that with all these indicators to the contrary – the number of which is growing – there appears to be much less than a fifty-fifty chance that he did. Therefore, the balance-of-probabilities is not with the jury’s explanation for what happened, and so the Lawful Killing verdict should be quashed and the Inquest redone with all of these anomalies being properly investigated and accounted for. Omotosho states something inconsistent with the jury’s verdict.